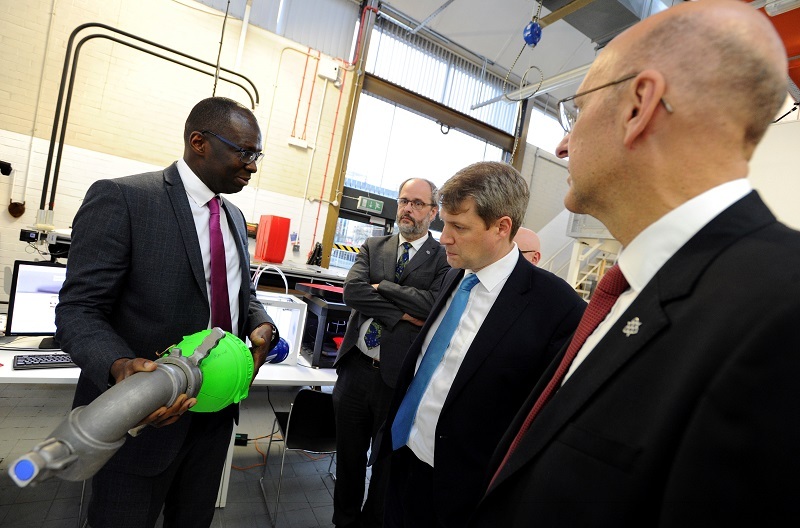 Universities Minister Chris Skidmore MP has been given an insight into how Manchester Metropolitan University delivers better outcomes for students and adds value to business, the economy and society during a visit to the campus today (21 December). 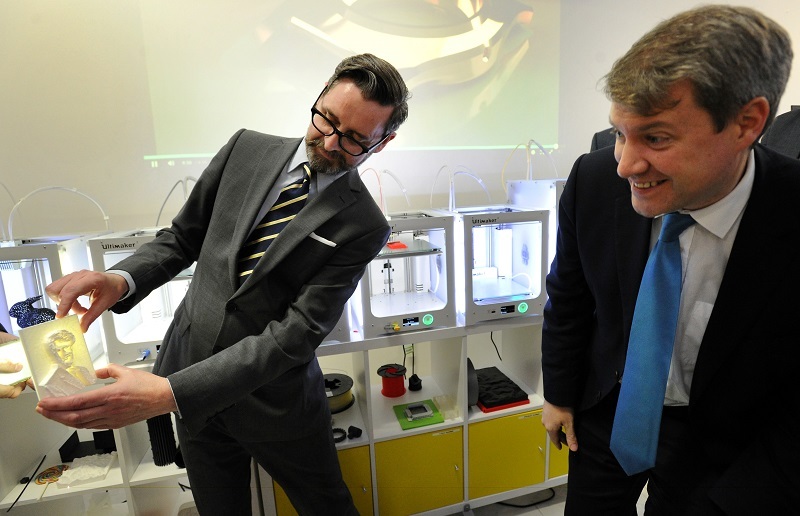 Accompanied by Manchester Metropolitan Vice-Chancellor Professor Malcolm Press and Chief Operating Officer Professor Karen Moore, the Minister, who took up his post in early December, was given a 90-minute tour of the campus, visiting the Business School, School of Art, and Print City, the University’s 3D printing hub. Mr Skidmore learned how the University is at her heart of the cultural ecosystem in the city, with the Poet Laureate Professor Carol Ann Duffy DBE as Creative Director of the Manchester Writing School, home to the UK’s largest community of academic and student creative writers and having produced more than 85 published authors. He then met with staff and businesses involved in our degree apprenticeship programmes. Manchester Metropolitan is the country’s leading provider of degree apprenticeships, having welcomed our 1,000th apprentice in September. Finally, he visited the Faculty of Science and Engineering to learn more about PrintCity, the advanced 3D printing research and training centre that drives industrial digitalisation and how we are in the top five of universities for our knowledge transfer partnership work with industry. Vice-Chancellor Professor Press said: “I was delighted to welcome the Minister to Manchester Metropolitan so early in his tenure. We are a large university with a distinctive demographic. A third of our students come from the Greater Manchester area and more than half come from families with no previous history of going to university. We see ourselves as a driver of societal change and are focused on creating a strong pipeline of graduates with education, skills and global outlook that will enable them to success in life. Mr Skidmore said: “Manchester is full of incredible talent and is at the forefront of developing the innovations of the future. Manchester’s universities play a key role in this by developing the skills of tomorrow.